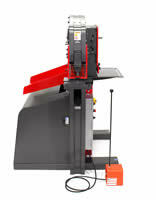 This 100 ton ironworker also has plenty of power for the Hydraulic Accessories available from Edwards, if ordered with the ** Powerlink System. 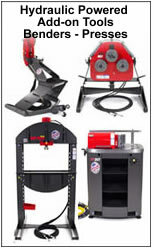 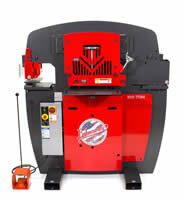 ** The Powerlink System allows the ironworker to power accessory tooling: 10 or 20 Ton Shop Press, 10 Ton Pipe/Tube Bender, Pipe, Tube & Section Radius Roller. 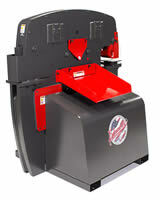 Powerlink System must be factory installed on new ironworkers. 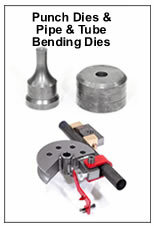 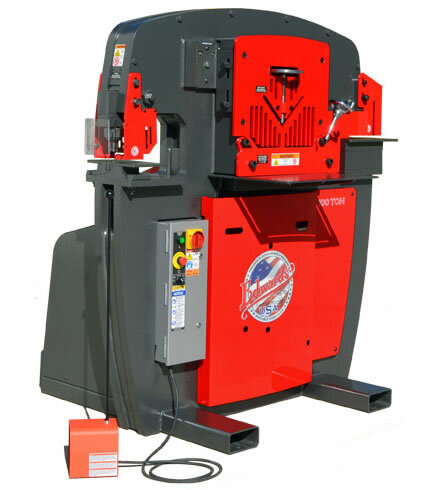 The 100 ton edwards ironworker punch can make 1-1/16th hole in 1" steel plate - Pedestal Die Table Punch is standard and allows for punching flange or web surfaces of 2" x 2" steel angle, channel and beam.